The key word is ‘Dark’. Oh, it is. You know what I mean. The Twelfth Doctor is ‘Dark’ to Clara’s ‘Feisty’. His descent into darkness and presumed moral ambiguity (no doubt personified by lingering close-ups accompanied by the low strings from the ever-too-loud Murray Gold) is part of every sodding press conference and interview this side of Gallifrey. In layman’s terms, this is preparing us for another Colin Baker. Which makes ‘Deep Breath’ this year’s ‘Twin Dilemma’, so that’s all good. Dinosaurs in London. Multiple occurrences of Daleks. And oh look, there’s Vastra declaring “Here we go again”. The U.N.I.T. analogy has absolutely no foundation, but that doesn’t really matter, because the basic point still stands: it’s supposed to mean some sort of continuity across regenerations. It doesn’t really work, of course, given that the first thing the Fourth Doctor did, right after wrapping the scarf around his neck, was bugger off in the TARDIS with Sarah Jane and Harry and run up and down an awful lot of corridors. Nonetheless, Moffat has gone on record (in a newspaper article I can’t find, but trust me, it’s there somewhere) as saying that this Doctor is going to be difficult, at least at first, but that Clara manages to connect with him through Vastra, Jenny and Strax. More amusing / infuriating, we have Capaldi’s declaration that “I’ve lived for over two thousand years”, which has presumably got the internet in a frenzy as people who gave up watching after ‘The Eleventh Hour’ say “I thought he was only nine hundred and six!”, at which point the others bring up the fact that the Doctor declared himself to be eleven hundred at the beginning of ‘The Impossible Astronaut’, and that a further century has passed by the time of ‘A Town Called Mercy’, and that another three hundred years pass in ‘The Time of the Doctor’ before he’s in his cane-wielding, shuffly Doctor phase. There is then an indeterminate amount of time before he reaches the geriatric, get-off-my-lawn Doctor with Brian May’s haircut and a colostomy bag that’s bigger on the inside. Because when you think about it, so much of New Who – particularly in the last three years – has been about redefining everything we thought we knew. Only someone of Moffat’s arrogance would have the flippancy to change an unseen event which has been fundamental to the tone of the show since 2005 and get away with it through the use of the standard memory loss technique that is central to multi-Doctor stories. Only someone with Moffat’s arrogance would have the audacity to reveal the reason why the Doctor stole that particular TARDIS. Only someone with Moffat’s arrogance would have the sheer audacity to bring in an entirely new Doctor that dates from before the period when he had anything to do with the show, and the fact that he gets away with it is in no small part down to the casting of and performance of John Hurt. Now we’re told that he knows the ending of series 9, or at least the penultimate episode. “Ohh,” he says. “I don’t think you’ll see this coming!”. No, Steven, we never see it coming because IT’S ALWAYS SO BLOODY OBSCURE. What are you going to do? 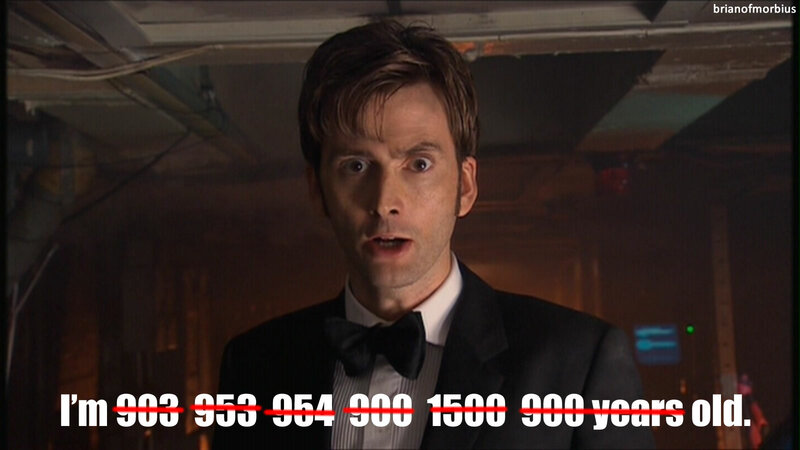 Reveal that the Time Lords have plugged all of humanity into bath tubs and stored them in a huge cavern? Have the entire cast sing an Aimee Mann song just before it rains frogs? 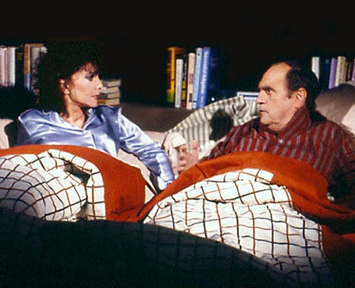 Or have Capaldi wake up in bed next to Anna Frobisher, muttering “Darling, you’ll never believe the dream I’ve just had…”? I’m ranting. And perhaps it’s not fair to turn Moffat into the sole target for this sort of abuse. We might level the same criticism at Malcolm Hulke and Terrance Dicks, who gave the Doctor’s people a name and a voice, or Robert Holmes, who made them a laughing stock (receiving hate mail in the process). But the difference is in the quality of writing. If I were in a particular frame of mind I might call ‘The Ark In Space’ the finest single contained drama ever to grace our TV screens. The anniversary special aside, Steven Moffat hasn’t written a single decent episode of Doctor Who since ‘The Doctor, the Widow and the Wardrobe’. Ultimately if you take this stuff too seriously it destroys you. Continuity never used to exist in Doctor Who, and then it did, and it’s impossible to really maintain it properly, but it still matters, and as a result the fans are obsessive about seeing patterns in things that aren’t there. That’s why there are arguments about whether Clara’s grandmother is actually an elderly Amy (despite being too short, the wrong nationality, and about twenty years too young): people are desperate to make connections. Perhaps it’s all about making sense of an increasingly senseless world. Or perhaps we’re just bored these days. For example, when I Googled ‘The Greatest Show In The Galaxy’ after watching it again with Thomas (verdict: quite fun, but don’t get me started on Whizz Kid), I found that the TARDIS Wikia paints the gods as Great Old Ones (a la Lovecraft), who existed before the time of this universe (and may have aided in the destruction of the old one). It then talks about other Great Old Ones including Fenric, the G.I., and the Celestial Toymaker. The impression you got was that various prose and audio writers have taken several unconnected stories and decided that the antagonists therein are all similar enough to be the same race. But this is generally interpreted, Gareth assures me, “to mean that he has seen things in several different millennia of times on Earth”. To which I say ‘Blibble’. The canonicity (is that a word? It should be) of Big Finish is debatable, of course – but in the end, it doesn’t matter. The stamp of authority will easily be undone by the next chief writer. I may object to the implications behind such changes, and what they mean for the way the show is produced, but that doesn’t mean I object to the changes themselves, so long as they mean quality television. Suffice to say I bolted into the study when I discovered the trailer was on YouTube (“I’ve never seen you move so fast,” remarked Emily) but if you’d measured my level of excitement you’d see a curve roughly the shape of a very tall and very pointy mountain – up and then immediately down again. Because aside from cryptic remarks from a stately Capaldi (who still looks like he’s nursing a hangover, but whatever floats your boat, Peter) there was relatively little of interest, except for a few monsters that we’ve already seen in publicity shots. So: yes. We know he’s dark. We know that series eight is going to be dark. We know that there will be painful comic relief and too many “Doctor Who?” jokes. There will be at least one point of view shot through a Dalek’s eyestalk (come back Christopher Barry, your country needs you). And there will be a lot of unnecessary brooding over the past, because if the future is an undiscovered country, the past is an assured cash cow – something that worked before can work again if you change a few things around. And I can’t help cringing when Capaldi says “I’ve made lots of mistakes. Don’t you think it’s time I did something about that?” Because while it’s fun to speculate on what those might be, my overriding answer is “No”. If you’re changing your entire outlook, I’m in, because that might be interesting to watch for a while. If you’re retreading old ground and visiting people that didn’t interest us the first time, this is going to be a long three months. Just move on. The past is the past. Let it go. I’m not that much of a Moffatt fan, but your criticisms towards him on making the character old, and fiddling with continuity have less to do with him having a big ego, and more to do with him doing the job as well as he can and addressing weaknesses as he sees them. There’s a major problem with the proportion of what we see of the doctor’s adventures. He was supposed to be 750 years old, but we ended up seeing about…20 years worth of adventures, because most of the old stories had no real breaks between them on continuity. So Hartnell supposedly lived a whole Time Lord life of 700ish years…and then most doctors lived about 3 years, because of the reality of actors moving on. It was a waste of the concept. Moffatt showed us a regeneration living a WHOLE lifespan, a long one up to a Hartnell age. I thought the Christmas planet was dull concept, but at least now we saw there was a life there. Same with his sojourn in Victorian England. It’s a big sci-fi concept and I like that it was there. This leads to the idea of him messing with continuity. One way of it is to say “he has a big ego, he’s trying to tell stories that matter in the continuity!” That’s his job – to tell stories that count. The show withers when it becomes planet of the week and it doesn’t matter. The show has to matter week to week or why bother doing it? Otherwise it becomes an Uncle Scrooge comic or an episode of Gilligan’s Island – the stories become disposable. I HAVE been disappointed by much of the Moffatt run, but the things you take him to task for I believe are healthy things for the show to explore, even if the stories themselves stumble. I can see the logic in your assessment of the Doctor’s age and the way it’s charted through the lack of story breaks. 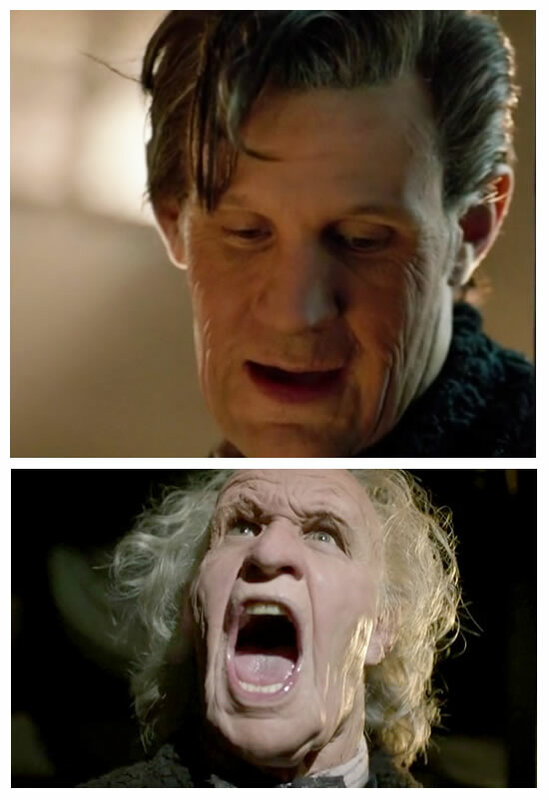 I’ve never felt there was any problem with a Doctor living three years before regenerating. it’s not typical Time Lord, because the point was that the Doctor spends centuries on Gallifrey doing nothing. That’s why Time Lords live for millennia (and why their society was so stagnant) – they never put themselves in jeopardy. Really, the concept of the Doctor using up his lives fairly quickly was not unlike the end of Batman Returns, when Michelle Pfieffer is getting shot at by Christopher Walken (although that was just silly). I think where we disagree is that I don’t think the show withered when it was in planet-of-the-week territory. The best X-Files stories were straight up monster tales that ignored the tedious conspiracy. Similarly – and at the risk of sounding like a nostalgia-driven grandparent (although I am neither) – I’ve always felt that Doctor Who was at its strongest when it was about a man travelling round planets seeing things. The Hinchliffe era is a prime example of this. Look at season 13. You have Terror of the Zygons, Planet of Evil, Pyramids of Mars, The Android Invasion, The Brain of Morbius and The Seeds of Doom. That’s four of the strongest stories in the programme’s lifespan, along with one pretty good one and one that is sub-par. 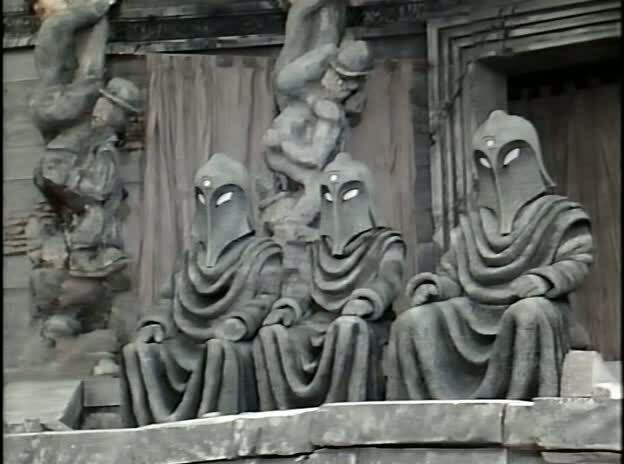 The next year – the next _year_ – you have The Deadly Assassin, The Robots of Death and The Talons of Weng-Chiang. All of these stories – Assassin aside – are the Doctor visiting a planet (frequently Earth) and having an adventure and going again. There is little that advances the character and little that affects long-term continuity. But there’s a reason why they’re so revered, and that’s the quality of the writing. Doctor Who went downhill in the 80s because of some poor writing (the death of Robert Holmes didn’t help), and JNT’s emphasis on silliness and some frankly ludicrous stunt casting. Don’t get me wrong – I’m not a Whovian luddite, and I’m not opposed to stories that count. Day of the Doctor moved things forward significantly, and I loved it. But The Deadly Assassin works as a story in its own right, and not _because_ it’s a game changer. I can’t say that about, say, The Wedding of River Song, which is nothing short of a disaster. These days the redefinition of the Doctor has become the end, rather than the means by which interesting and entertaining narratives have been reached. Doctor Who under the current regime is all about evolution for its own sake, and that can’t be any healthier than a show that rests on its laurels. I accept that I am a little harsh towards the man – but I have always felt that there is an arrogance in the way that Moffat deals with and engages with the fans, on and offline (his media exposure and the way he conducts himself frankly doesn’t help). Perhaps it was ever thus, but we didn’t have to _see_ it.